I currently use dbForge Studio, and this is one of the best database administration tools that I have ever used in my professional career. It is a swiss knife for application developers and DBAs. This is the best MySQL dev tool on the market. If you develop in MySQL this is your IDE. If you are a DBA responsible for maintaining MySQL databases, get this tool. Simply AMAZING. Although most of my work is done in SQL Server, I love this application when I have to develop MySQL databases. Get it, you won't be sorry! Overall the best database development tool ever and I've tried several over last several years. Would have bought MS SQL version if I could to replace enterprise management studio. Maciej Zagozda, Head of Architecture, Taskscape Ltd. I was really impressed with the UI, usability and wide set of features. It’s a very strong product. I don't often find myself contacting software vendors unless there is some type of issue, whether it be technical, upgrading, or whatever, however, I have now used your product (dbForge Studio for MySQL) for a while and I can say without a doubt, it is the best product for schema comparison, data comparison, and overall handling of MySQL that I have ever used. As a software author, I appreciate the attention to detail, intuitive interface, and simply the overall professional appearance and functionality of the product. So, just a note from a fellow developer to say thank you for this tool and that it is MUCH appreciated and used quite frequently. Bill Zink, CEO, BRZ, Inc. I just felt the need to again express my appreciation for your products again. I’ve used them for 3 years and my appreciation has only grown stronger. I live and breathe by Visual SQL Management and Designer tools (MySQL and SQL Server). I wrote SQL queries for years but my fingers simply got worn out. Plus, my brain is visual so a 10 or 15 table query is just less taxing to digest visually. Plus, I’m often allowed about 10 minutes or less to deliver a completed query and it’s just so much quicker to drag-drop-and-click. Plus I just can’t remember every table, column, and relationship on a complex 300 table database, much less every command, phrase, syntax, and option. I realize you offer so much more than visual tools, but those are the ones I work with daily so I appreciate them more. There are a number of other visual SQL managers & designers out there but none of them I reviewed or tried using seem to “get it” when it comes to ergonomics. Plus; your pricing met our budget. So, a giant THANKS for making me a hero every day. Excellent tool, specially debug functionality for db stored procedures is simply awesome. Good work! I will defiantly recommend it. The best GUI DB management I have used. Love this. Congratulations on one of the best software suites I have encountered in 30 years of working in data processing and analysis industry. Many times I have wished for data stored in readily accesible custom format to suit my need for a given project. Now I can quickly build my own database schema, import data from multiple formats, have guided help on SQL scripts and even produce great looking data reports and charted graphics. All of this in one intuitive and integrated product. The guys working at MariaDB and MySQL should appreciate the compliment of quality tools like this to bring alive their efforts. Great product guys! Keep up the excellent work! This product has made my database development needs tremendously easier! Daniel Joun, Systems Integrator, Integrated Automated Solutions, LLC. Till I used your program I didn't know that I would ever find a program that I could understand as a beginner in less then 15 minutes. You Rock! I meant it that I have tried multiple programs and yours was the easiest to learn and did the job of moving my data to MySQL so fast I was shocked. It's the best DB program I've found, a lot better than MySQL Workbench, which is basically godawful corporate bloat. Sorry to be bashing someone else's software, but I had been using it for a while and I was really relieved when I found yours. Just looks, feels and works great! Yip very well aware that I can run that on command line - just when you have a tool you enjoy so much you want it to have the little bells and whistles too ;) I've seen this on Navicat and HeidiSQL which is the tools I used to use. But no worries - really enjoy the product; keep up the good work. ... This is also a good point to congratulate to the Devart team for the excellent software you developed. I use now dbForge Studio since many years and it helps me to make my MySql development so helpful. All the helpful functions to administrate, modify, debugging etc. the db is absolutely great. Without DBForge Studio I'm not able to do my work so easy and fast. Also the response/questions I had in the past was responded on a fast and always helpful way. I have been trying to learn SQL. dbForge Studio has helped me learn how to do queries and so much more. This tool is worth it. I have both Windows and Linux MySQL servers and I must say here that I greatly enjoy using dbForge Express. It is a productive tool at one hand and a great help to the open source community at the other hand. Once again: Thank you! You have created a fantastic piece of software. I rated "Don't Know" on the documentation because I haven't needed it. I am very much a beginner and your software has enabled me to jump in like a pro. Not only was it a tool that compensated for my lack of knowledge but was a tool that expanded that knowledge. I'm not one to usually leave feedback, especially if I am satisfied but I felt a strong need to here because it's that good. I'm administering a MySQL database now and am looking into a position managing a Microsoft SQL database and your software will be at the top of my list! After evaluating a number of tools such as Oracle SQL Developer, Aqua Data Studio, SQL Power Architect, MySQL workbench etc. I decided on dbForge studio. It was rich with functions and features, great on usability and very cost effective solution to manage my MySQL database development needs. I love this product! It enables me to administer, manage, code, debug and inspect all of my production/development MySQL servers. Rotem Fogel, Director of MySQL, Valinor Ltd. Customer Support is the best I've ever experienced. I had a specific issue and the support team worked with me extensively to resolve the issue in record time. Between the tech support and the user friendly interface, I highly recommend this product. The data compare feature works like a dream! This version 4.70 looks very interesting, from what I heard of your colleagues and this too! Thank you. You not only have a great product but you support it very well. It is a pleasure to be your customer. The tool works great for building/debugging procedures, and the IDE is sweet (faint resemblance to VS)! Keep up the good work! dbForge Studio is fantastic... this is a wonderful product, and I wanted to congratulate the whole team! It really fits all my needs. This product is worth the last dollar! Very excited to try the new 4.0 release! From the release notes it looks as almost all of the things I've been waiting for have been included. Most importantly, it looks as if the ability to select a database for easy query execution (so I don't have create a USE clause), as well as a new way to execute stored procedures is in---excellent news! It's those little things that make my time with SQL easier. Actually, I just installed and yup, exactly as I hoped : ) The new parameter dialog is perfect, in fact it's better than SQL Server Studio now. Also, I don't know if the 'Grant All Privileges' right click option has always been in the security manager, but well done--that's a huge time saver for me as I create lots of test accounts. Anyway, excellent work, you've made me a very happy developer--hopefully others will enjoy the new functionality as much as I do! Finally, I just wanted to say I'm so happy about this new version (like a child!) that I just recommended it to one of my users. I own my own software company, and deal with lots of users who use MySQL. Let's just say that I plan on recommending you stuff much more! I just downloaded the free adition as I needed a MySQL client tool. I'm very pleased with the look and feel as I'm a Visual Studio user and when I ran the program it felt like home. A good job well done! I'm very satisfied with your product. We run a manufacturing production database using MySQL. As our electronics production line has many custom machines writing testing data directly to the database, we make extensive use of stored procedures and triggers. The "obvious" tools for MySQL proved inadequate to the job of developing and debugging MySQL procedures. We were delighted to find Devart dbForge Studio for MySQL, which has excellent editing and debugging support for MySQL Stored Procedures and Triggers. It is a full suite of MySQL management tools which we use daily, but the debugger beats them all. We use it extensively. We are impressed with the Devart team. Wonderful service, wonderful support, and always with a smile. Thanks Devart for an exellent and affordable solution to our MySQL database development needs. This product is a great value. It provides a full featured management and development suite for MySQL. The ability to graphically design and edit views and queries is indispensible and the implementation of this feature in dbForge is first rate. There are many areas of this application that I have yet to fully explore, but for a $99US package I am happy to see that it gives me everything I need and is robust and stable. Impressive! Devart's dbForge Studio represents a perfect blend of useful features and top notch customer service support. 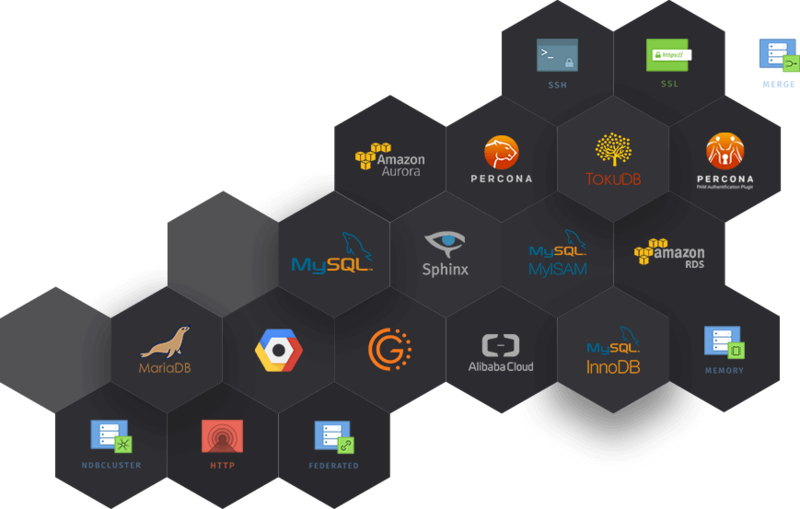 From the core SQL tools to great new features like the Visual Database Designer, just about every database task you can think of is handled with grace and efficiency. Even better, should you ever need it, customer support is always quick to respond and just as helpful. I'm a demanding guy, dbForge Studio delivers. I really start enjoying the program a lot. I come from the "MS SQL world", where we use advanced tools like yours for some years and it really started to add value to my daily work now. I am able to focus on the design and the creation of the database which boosts productivity quite a lot, instead of worrying about typing queries and joins manually. Keep up the good work, I am looking forward to your new release. Mainly I make business software for windows-based systems (sometimes with unix-based servers, web servers). ... I have to use cheaper, but stable database technologies, to get more work/projects. I prefer MySQL and Firebird. I tried some products, but yours were the best for me. For this time, I have to say I'm very pleased. dbForge Studio is a very good program for plan databases / data structures. I tried more MySQL manager programs and I always have problem with SSL connections, because the others couldn't work without PUTTY or SSL tunnel. I'm really satisfied with dbForge! You did a great job!. I have tried several database manager tools (ex: Navicat), but dbForge was the best! Thank you for your support. You have an excellent product.